Online Registration will open May 1st, and ends August 1st at 5pm MST. If space permits, you may still register in-person ($50) on Friday August 2nd from 4-6pm during race packet/goodi bag pickup in Teton Village. There WILL BE NO registration the morning of race. 8:30 AM for both race categories, with the "competitive class" queued at the front. Both classes will start at the same time, on the same course. For time constraints, the separate hiking/walking class has been eliminated. Those wishing to hike may still enter the non-competitive class. 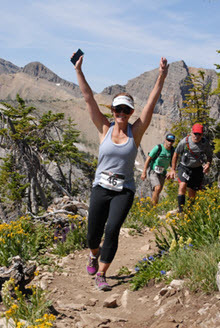 Pre-registered entrants may pick up race packet/goodie bag starting on Friday August 2nd from 4-6pm near the Teton Village Commons area, or on Saturday August 3rd from 7-8:00am in the Teton Village Commons area. T-shirt size requests are only guaranteed for the first 200 at packet pickup, on a first-come first-served basis. We'll do our best to accomodate all requests. Friday pickup provides best chances! The Award Ceremony will take place at 12:00 on the Village Commons (near base of the Aerial Tram). The HUGE raffle will follow. Must be present to win! For 2019 there will be a $5000 cash purse! $1000 each for top male/female finishers, $600 2nd overall male/female, $300 3rd overall male/female, $50 for top age group winners. 2 aid stations are provided along the course (near Casper Restaurant and top Bridger Gondola). However due to the backcountry location and rugged nature of this race, racers are encouraged not to depend on these stations as their sole supply of water. The race will go on rain or shine (or snow!). Please dress and be ready for all kinds of weather, as Rendezvous Mountain and the top of the Aerial Tram are known for variable weather. In early August, the weather is generally clear/cool in the morning (50's), and warm/sunny by mid day (mid 70's). Thunderstorms are not uncommon in the afternoon. Course updates will be provided on our Facebook Page. Please visit the FAQ Page for answers to other common questions. The most demanding hill climb running event in the West! A little over 4100'vertical in just 6.1 miles, on nearly all singletrack! This non-profit annual race is run in honor of our friend and longtime JHMR Aerial Tram mechanic Chris Onufer (Captain "X"), who on March 7th, 2012 tragically passed away in an avalanche. 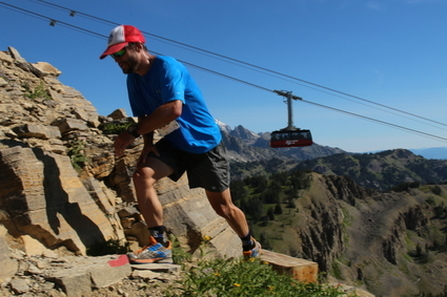 Starting in 2015, the Teton Trail Runners and Jackson Hole Mountain Resort reinvigorated the Rendezvous Hillclimb with a new and improved course. It's a pretty "X" course as Onufer would say! 95% singletrack all the way to the top of the world famous Aerial Tram! And to keep the spirit of running alive for future generations, the Teton Trail Runners donates 100% of the proceeds to the trails division of Friends of Pathways, all in the name of Chris Onufer. $500 bonus for the first person to break 1 hour! The route is the same for both categories. Aside from the first 3/4 miles, the corse is almost entirely singletrack up the Wildflower and Cirque Trails! Starts just outside the Teton Village Commons (near base of Aerial Tram) and ends at the top of the Aerial Tram.